Want to know How Nail Art Have Taught Me Wonderful Lessons? Make the best of nail art….NOW…!!! Look up and read through blogs and inspire yourself to get the nail art perfection. The moment you decide how you want your nails to look today, you already won half the battle. 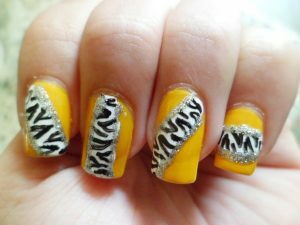 After the dnd nail polish, white, black and yellow have become a combination that I’ve fallen in love with. I remember seeing a nail art tutorial on YouTube and I’ve been inspired ever since. I just wish I could. I’m sorry I cannot search for the video URL right now. This exact same combination was again used by VOV and the dark lines were drawn using sketch pens designed for nail art.